Nick Critelli of Des Moines, an English Barrister, has become the first practicing American lawyer since 1919 to be designated a Master of the Bench of the Middle Temple Inn of Court. Barristers are admitted to the practice of law by their Inn of Court , which is also responsible for their training and regulation. The Masters of the Bench, or Benchers, are responsible for the governance of the Inn. Masters are elected by their peers from the Inn’s members who have been called to the bar. The majority of the Inn’s Benchers are Queen’s Counsel or senior members of the judiciary. Critelli was honored because of his work involving the training of new lawyers. Annually, for the past twenty five years, he has hosted new barristers who come to Des Moines to learn advocacy and trial skills and compare and contrast litigation as it is practiced the United States and United Kingdom. Critelli’s twenty fifth pupil, Ian Marshall, has just completed his pupilage with Critelli and returned to London. Critelli, and his son Tre Critelli, are two of four practicing American lawyers who are qualified as barristers at the English Bar. Critelli becomes the first to be elevated to the position of master of the bench and receive the title Master Critelli. Critelli is a past president of the Iowa State Bar Association, the Iowa Academy of Trial Lawyers and the American Academy of ADR Attorneys. He maintains an active practice in Iowa and London. 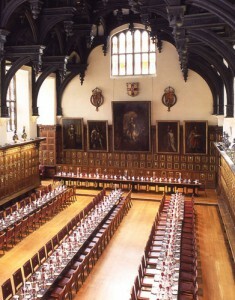 The Middle Temple has played an important part in the development of American law. Sir Edmund Plowden, a Master of the Bench and Treasurer of the Inn, is credited with being the father of the modern legal profession; Sir William Blackstone whose work, “Commentaries on the Laws of England” forms the basis for Iowa common law. Most importantly, the Middle Temple is proud of the fact that five signers of the American Declaration of Independence were members of the Middle Temple: Edward Rutledge, Arthur Middleton, Thomas Heyward, Button Gwinnett and John Dickinson. The Middle Temple is proud to have several distinguished Americans who are Honorary Benchers including the Chief Justice John Roberts of the United States Supreme Court and U.S. Attorney General Eric Holder. Log in | 77 queries. 1.349 seconds.